Concordance tables bridge the gap between the ACT and SAT scales, providing a guide to link equivalent scores. They’re not only essential for admissions staff, but also for students and families to help decide which test is the best choice. The newest concordance tables were released this summer, replacing the contested tables that were posted by the College Board, without input from ACT, in 2016. The range of possible SAT scores that a student can achieve is much wider than the range of possible ACT scores. There are only 36 distinct score possibilities on the ACT, whereas there are 120 possibilities for the SAT, a test which increments its scores by 10 points between 400 and 1600. This means that the concordance table needs to assign a range of SAT scores that match a given ACT score. The official 2018 ACT/SAT concordance tables can be viewed here. How Different Are the 2016 vs. 2018 Concordance Tables? · For the highest scores on the scale, the top SAT scores have become more valuable in comparison to ACT scores. For instance, a 1540 on the SAT is now considered equal to a 35 on the ACT. Previously, concordance charts had linked the SAT’s 1540 with a 34 on the ACT. · For the lowest scores on the scale, the bottom SAT scale scores have become less valuable in comparison to ACT scores. A clear example of this is at the SAT score of 590. While this was previously equated to an 11 on the ACT, this score is now linked to a 9, dropping its value by two points. · Near the middle of the score ranges, (21-24 for ACT, 1060-1190 for SAT) the concordances did not change at all. The new concordances do not change much for students when it comes to college admission, so this minor adjustment will not make waves. However, the new concordance information does have the potential to affect minimum scores for merit scholarships or programs that require clear-cut SAT or ACT score ranges. It is likely that the response will be mixed: some institutions will adjust their required ranges, while others will just stick with their established status quo. Our advice for students starting test prep does not change: if you are deciding between the ACT and SAT, it is still important to take a full-length practice test for each. When you have completed both tests, compare your scores against the 2018 concordance chart. 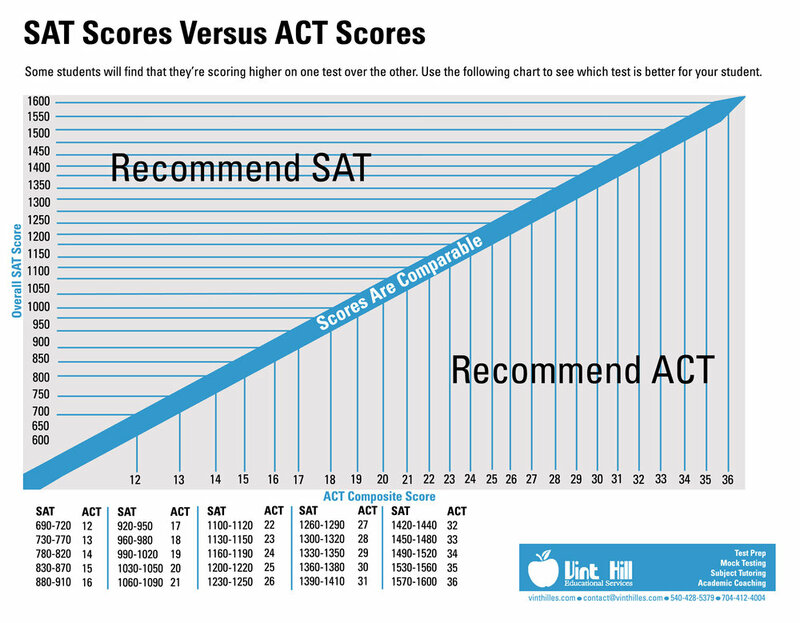 If your SAT and ACT scores are comparable, you should choose whichever test you preferred. If one score is significantly higher, opt for that test instead. The new concordance tables do not change the process of selecting a test; however, they do help to standardize how students, guidance counselors, and admissions committees compare test scores. If you would like to take a practice ACT or SAT to compare the exams and assess your testing skills, Vint Hill Educational Services offers mock tests in group, individual, and at-home formats. Along with the test booklets, you will receive testing instructions and full diagnostic reports showing score breakdowns in each of the test sections. For more information, please read on, or visit our Mock Testing webpage.